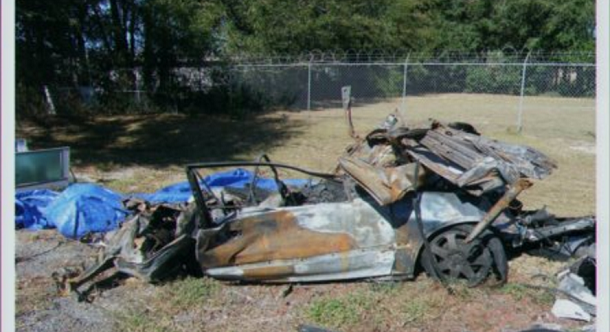 An image of the Maldonados' car after the wreck that killed Deborah and Eliezer Maldonado, Jr. The image was shown during openings at trial against Theorphilus Clark, Wayne T. Fellows Inc. and Peoplease Corp., accused of responsibility for the crash. Ocala, FL—Attorneys debated who caused the late night, 2012 truck crash that killed a Florida woman and her 12-year-old son, as trial opened Wednesday against the trucker and companies that hired him. Maldonado v. Wayne T. Fellows, et al., 2013CA001308. “Every person in the trucking industry—whether it be the truck driver or the trucking company—must know the rules and regulations, and must follow the rules and regulations. And when they don’t, bad things can happen,” Marianne Howanitz told jurors in openings against truck driver Theorphilus Clark, trucking company Wayne T. Fellows Inc., and trucking human resources firm, Peoplease Corporation. Deborah E. Maldonado, 35, and her son, Eliezer Maldonado, Jr., 12, were killed when a tractor-trailer driven by Clark hit the Maldonados’ car as it sat stranded late at night in the middle of the road on I-75. The car had been disabled minutes earlier when it was struck by another car driven by Lanessa Riobe, who fled the scene. Riobe, whose blood alcohol level was over the legal limit when she was caught, ultimately pleaded guilty to two counts of DUI manslaughter and is serving 10 years in prison. But Deborah Maldonado’s husband, Elizer Maldonado Sr., who, along with the couple’s daughter, Andeliz Maldonado, had left the disabled car before the second crash, claims Clark’s negligence killed his wife and son. Womble told jurors Riobe was the person responsible for the Maldonados’ deaths, reminding jurors of her guilty plea to manslaughter charges. “If Ms. Riobe had not been intoxicated. If Ms. Riobe had not negligently caused the impact with the Maldonados, Mrs. Maldonado and her son would be alive today,” he said. The trial is expected to last three weeks. CVN is webcasting the trial live, gavel-to-gavel. Eliezer Maldonado is represented by Marianne Howanitz and The Ramsdell Law Firm’s Dan Ramsdell. Wayne T. Fellows Inc. is represented by Cole Scott Kissane’s James Sparkman. Theorphilus Clark is represented by Rissman, Barrett, Hurt, Donahue, McClain & Mangan's Richard Womble. Peoplease Corporation is represented by Alvarez Winthrop Thompson & Storey’s Griffith Winthrop.